Blue Line Fishing, LLC is equipped with a 21′ Sabalo Bay Boat, the perfect SWFL boat to handle everything from the roughest waves to the shallowest flats. The Sabalo is fully equipped with all of the bells and whistles needed to ensure you and your family have a great day on the water. Fishing gear includes; G Loomis, Crowder and St. Croix rods equipped with Diawa and Penn spinning reels. 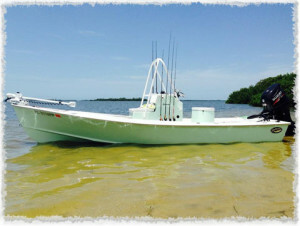 Florida fishing licenses and drinks (water, soda) are additionally provided. Blue Line Fishing Charters, LLC recommends that you bring: a hat, sunglasses, sunscreen, towels and snacks.